The Philadelphia Vietnam Veterans Memorial was dedicated October 23-26, 1987, with 630 names. Currently 646 names are inscribed with two more to be added soon. That’s about one out of every ninety names on the national memorial. A candlelight ceremony with the reading of the names is held annually on the Friday closest to the original dedication date. Battery-powered lights are now used rather than regular candles. 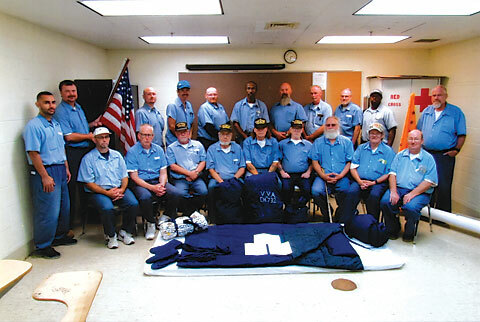 VVA’s Liberty Bell Chapter 266 has conducted the ceremony for several years and did so on again on October 23. 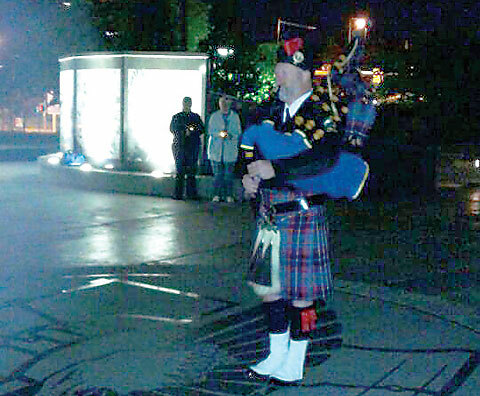 This year and last, a lone bagpiper played before the ceremony’s start. About fifty people were in attendance this year, most of whom read the names on one of the thirty-four panels. Chapter President Steve Uchniat was the master of ceremonies. A Marine sang the National Anthem, Chapter Chaplain Leonard Johnson gave the invocation, and the Marine struck a bell at the reading of each name. After reciting the names on a panel, each reader took a small American flag and a light and placed them in front of the panel.